A famous parent can be something of a monkey on the back. Despite being closer than anyone to an influential mother or father, the young'uns are always under pressure to be different or risk being labelled a throwback to Ma or Pa. Just ask Dweezil Zappa, Julian Lennon or Chas & Dave's kids. Some, like Dweezil Zappa, find they're their Dad's biggest fan and, far from eschewing a famous back catalogue, instead embrace it. In Dweezil's case, the resulting 'Zappa Plays Zappa' is an endearing and loving tribute to Frank Zappa's music. For others, it can be a career-long struggle. 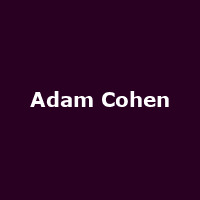 Born in 1972, Adam Cohen is the eldest child of Suzanne Elrod and Canadian folk rock legend and poet, Leonard Cohen. By his own admission, Adam spent far too long trying to insist that he was his own man before acknowledging that he was lucky enough to have Cohen Senior as a mentor and that, inevitably, his own work will bear a degree of his father's considerable influence. Although four albums into his career, it is only with the most recent, 'Like a Man', that Adam Cohen has fully embraced his heritage and, in doing so, produced what many say is his most stylish and individual work yet. Adam says that 'Like a Man' is "steeped in my recognizing that I am in the family business. Despite my efforts to carve out a different identity, really I belong to a long line of people who have embraced their father's business". The album will be released in the UK on 3rd October, a month or so before Cohen Junior embarks on a headline tour of the UK and Ireland. Adam Cohen's tour kicks off in Ireland, with dates in Cork, Dundalk and Dublin, from 2nd November, crossing the Irish sea and hitting Bristol (Thekla) on 6th November, followed by shows in Manchester, Birmingham, Glasgow, Liverpool, Norwich and London (Bush Hall) before the final gig of the tour at Komedia in Brighton on Monday 14th November. We will have tickets available for all gigs except Cork and Dundalk when they go on sale at 9AM on Thursday 1st September, priced £14 for Norwich, £17.50 for London, £16 for all other UK dates and around €14 for the Irish dates.